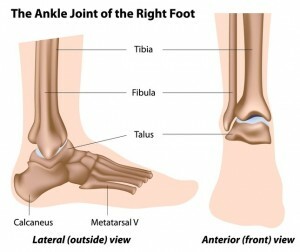 The ankle is made up of multiple bones, muscles and connective tissues (ligaments) that work together to provide stability and support and prevent excessive movements. When you fall or experience any traumatic injury involving the ankle, you are susceptible to fracturing, or breaking, one or more of the three bones in your ankle joint – the fibula, tibia and talus. The bony bumps on the end of the fibula (the lateral malleolus) and tibia (the medial malleolus and the posterior malleolus) are also susceptible to fractures. Ankle fractures can vary in severity, ranging from tiny cracks, or stress fractures, to complete breaks. What causes an ankle fracture? An ankle fracture, also known as a broken ankle, occurs when one or more of the bones that make up the ankle joint are broken. A fracture can result from many types of accidents or injuries, but the most common include falls, car accidents, sports injuries and missteps. In addition, overuse or impact from a heavy object falling on the ankle can also lead to fractures. You may feel or hear a snapping sensation at the time of the injury, however, that does not necessarily mean you have experienced a fracture. Some of the symptoms of an ankle fracture may also be the same for a foot fracture and should be examined by a doctor for a proper diagnosis. What are the risk factors for an ankle fracture? What are the treatment options for an ankle fracture? If you are experiencing pain, swelling or tenderness in the ankle area, call our office at 212‑434‑4920 or fill out the schedule appointment form on this page so Stuart Katchis, M.D. can evaluate and treat your injury as soon as possible. It is important to seek medical evaluation for any injury that does not improve within 2-3 days, especially if you are not able to bear weight on the injured leg. Treatment options for an ankle fracture will depend upon the location and severity of the fracture. An ankle fracture commonly requires a manipulation procedure called reduction wherein the doctor repositions the broken bone so it will heal properly. A cast or another type of splint is almost always required for a broken ankle in order to immobilize the broken bone(s) and enable proper healing. Taking over-the-counter anti-inflammatory medications can considerably reduce pain. If necessary, Dr. Katchis may prescribe a stronger medication to lessen your discomfort. Applying ice to the injured area and elevating the leg will help reduce pain and swelling. After a broken bone has healed, proper rehabilitation is often necessary to loosen up stiff muscles and regain strength in the ligaments that support the ankle bones. Ankle fracture surgery may be required if nonsurgical treatments will not prove effective, particularly in cases of more severe fractures, including those with multiple broken bones. The surgical procedure may involve Dr. Katchis inserting special pins that stabilize the broken bones and hold them in the proper place during healing. Following the surgery, usually performed on an outpatient basis, the lower leg and foot will be immobilized using a cast. With both nonsurgical and surgical treatment, physical therapy is an essential part of the recovery process. Stuart Katchis, M.D. will recommend that patients begin rehabilitation once the bone(s) show signs of significant healing. Physical therapy will help loosen stiff muscles and rebuild strength in the ligaments that support the ankle bones.